If you follow along with us on Facebook, Twitter, or Instagram the school lunches Little Miss has had so far this week have been simple & quick fix. Since Wednesday is her last full day of school for third grade, I figured we'd go out with a BANG and do something fun! 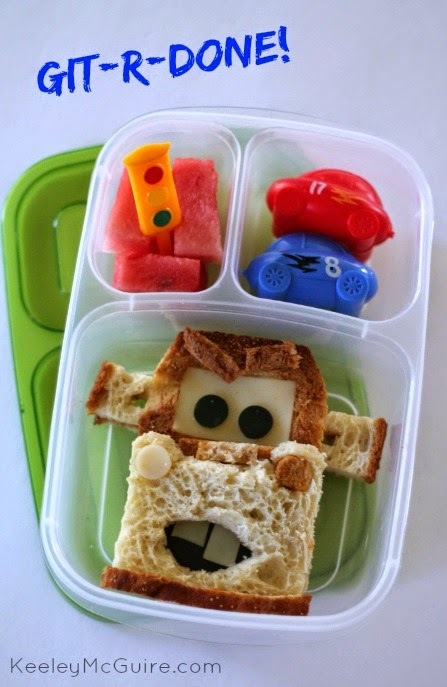 If you've been following us for a while, you know that just because school ends that doesn't mean packed lunches end. We pack all year! Food allergies & intolerance's don't go away just because it's summer break. So make sure to keep checking back for summer time ideas & recipes, as well. Does this guy look familiar? Name's Mater. 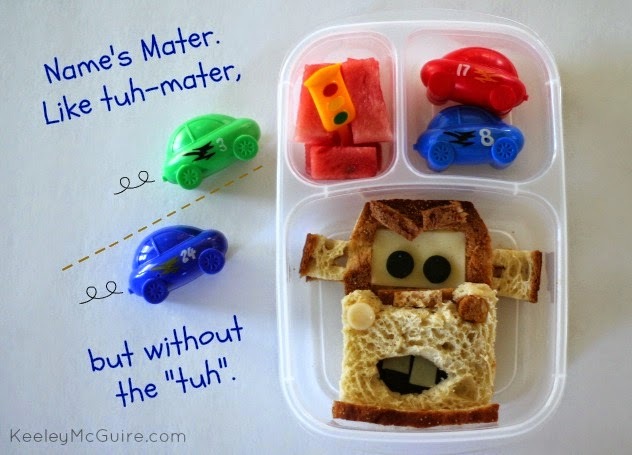 Like tuh-mater, but without the "tuh". I was inspired by one of my favorites: Funky Lunch. They made such an awesome Mater sandwich, so I did my best to duplicate with Canyon Bakehouse Gluten, Dairy, Nut, & Soy Free Bread. I know you're probably thinking this took hours, but I'm not kidding that it only took about 25 minutes to make! Granted, I've been packing lunches and making silly sandwiches for about six years ;) but I was so pleased with how it turned out. The sandwich filling is Nut Free SunButter No-Sugar Added Natural Spread and honey. The SunButter, or a dab of honey, was also used as my "glue" to hold all the parts together so it would be intact when she got to school okay. The eyes and inside of the mouth is made from cucumber. The teeth, headlight, and windshield, which is also part of his eyes, are made from a Daiya Dairy Free Provolone Style Slice. 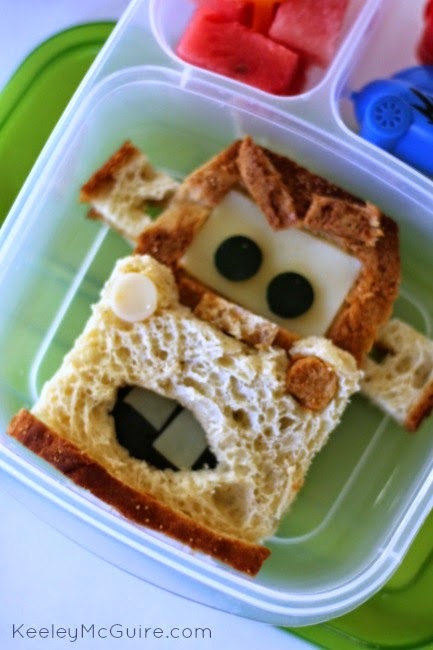 Also packed in her lunch are the adorable race cars that are actually "Easter Treat Eggs". I purchased them at the Dollar Tree around Easter time and they came 8/ pack. So cute! I filled them with diced carrots for her to munch on. She also has watermelon with a stoplight pick. Needless to say, she was THRILLED to see the final result and is excited to show her friends at school! Mission accomplished. This is adorable! Hope Little Miss has a wonderful last day of school.